12:13 that's my planned trades for the day, so I'm done. Thanks for coming. See you in 2 weeks. Next week is camping. Take a course or 2. 9:42 on the MTRainbow chart, the 55 minute EXMA is magenta. The yellow 20 EXMA would have to cross down through it for a sell . 9:25 prices are hanging around the Moon +T090 electric field flux-see the SPSunMoonMer chart. 8:55 trade times today are 09:31 and 11:21 . The first is just after the outcry session open. 8/3/2012 10:08:10 AM MT AG:: FWIW, there is a gap at 1394.50 that has yet to be filled from ages ago. 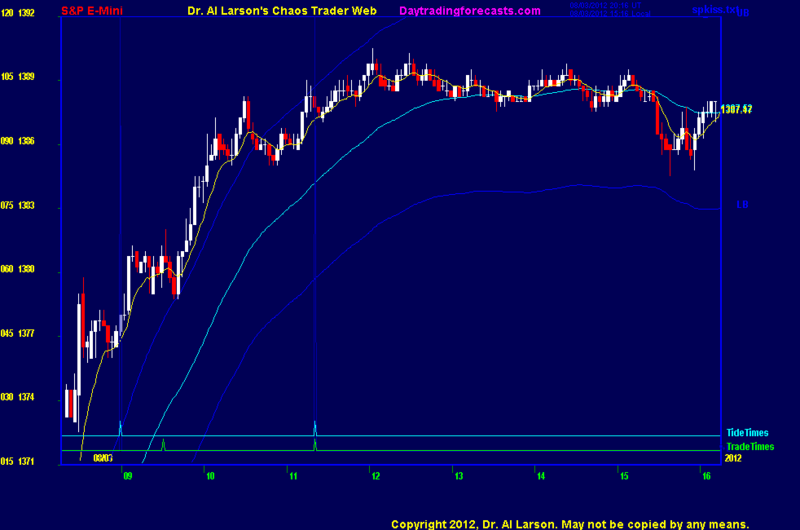 That level also happens to be 9-point extension from low of current move at 1385. 8/3/2012 10:02:31 AM MT sdg:: Meetings all morning, but got in before this juice...hope your correct BBB. 8/3/2012 8:09:14 AM MT BBB****:: Out for a nice one - thanks Al! 8/3/2012 7:51:27 AM MT BBB****:: Bought 79.75 on the little dip. I took 3 out earlier and bought right on the little dip before 9 am EST tide time. 8/3/2012 7:26:01 AM MT sdg:: The combination of out of band and near resistance is temtping for a smaller position short setup. 8/3/2012 7:21:47 AM MT srj****:: gm all. 8/3/2012 6:18:32 AM MT sdg:: GM all - here's to persistency. 8/3/2012 6:06:43 AM MT MK:: GM all-have a great day.